An ideal instrument for pinpointing combustible gas leaks; testing appliances in commercial, residential, and industrial applications; surveying gas pipelines; and inspecting valves, regulators, and meters on gas equipment. 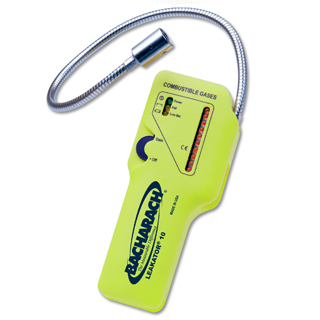 Bacharach's Leakator® 10 is a low maintenance combustible gas leak detection unit, small enough to be operated with just one hand, yet loaded with the kind of advanced features and technology professionals demand. Powered for up to 30 hours of continuous operation by alkaline C-cell batteries, the Leakator® 10 allows you to pinpoint large and small leaks quickly, while checking a relatively large area in a short amount of time with absolutely no calibration required. The Leakator® 10 comes complete with a flexible 20-inch long probe for hard-to-reach areas and a patented solid state sensor that will last for up to five years. Includes a Hard Carry Case! 306 TruReward$ points will be placed in your account when you buy this item.